Calling Harness Racing trainers - the communication platform for you! Are you a trainer in harness racing, but currently don't have a one-stop shop for communicating with your owners? Fed up with having to phone owners individually to update them on how their horse is progressing? Have you ever wanted to be able to communicate with owners in a quick and easy way, but haven't been able to find a platform that suits you? Well look no further, as we have the solution for you! From just $19 per month, we now have a cost-effective solution to your problem. The one thing that is missing in the Harness Racing industry is a platform where communication from trainers to owners is fast, easy, and most importantly, affordable. With over ten years of experience, miStable has the knowledge and expertise to help you keep your owners up-to-date with all the latest information on their horses, all directly from your smartphone. The miStable software is developed by industry professionals who understand the importance of a communication tool that is quick and easy to use. 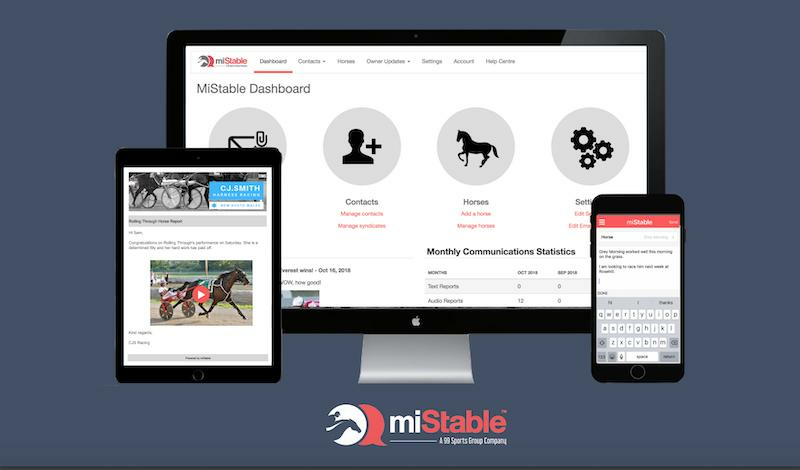 Currently, miStable is the communication solution for over 400 trainers, studs and syndicators around the world. The multimedia functionality of the MiStable App enables more interaction with your owners. Simply send a text, photo, video or audio updates from the track, stable or paddock as soon as they happen, offering the best possible experience to owners. Your correspondence is also customised and always looks professional, adding that extra touch to your owner communications, and we offer account set up at no charge! The benefits don't stop with the trainer. There are also many benefits for owners, and with the recent launch of our new MiStable Owner App, miStable is now offering your owners the full digital experience with owner updates. The best part? If an owner ever misses an update, they are all stored in their miStable account, which allows them easily revisit older updates in the one place if they wish! miStable Pricing is based on the amount of horses within your MiStable account. Pricing starts from AU$19/mth for 1-15 horses. The Communications component is the base, and you can add either Racing Data and/or a Website to your account. And it doesn't stop there, in the coming weeks miStable will have also have a Horse Management component, together with an integrated Xero Billing solution. It's easy and simple, just like our platform! You can sign up to our 30 day free trial through miStable.com to experience the benefits firsthand. Prices start from just $19 per month. You will love it, and most importantly your owners will love it too.